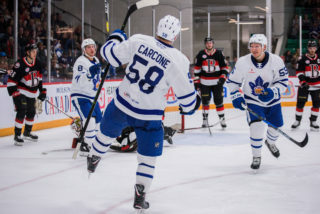 The Toronto Marlies closed out the 2018-19 regular season today with a divisional matchup against the Cleveland Monsters. Playing for their playoff lives, the Monsters came out hungry in the opening minutes. They tested Marlies’ goaltender, Eamon McAdam early and often, but he was up for the challenge, turning away all 20 shots he faced in the opening 20 minutes. Monsters leading scorer, Zac Dalpe opened the scoring just 20 seconds into the third period, assisted by Doyle Somerby and Ryan Collins. Hudson Elynuik responded at 9:11, getting the Marlies on the board after redirecting a point shot from Eemeli Rasanen. Griffen Molino picked up the secondary assist on the goal. 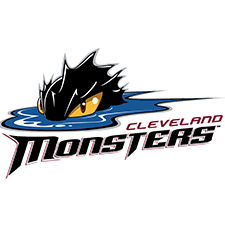 From there, the Monsters responded with four unanswered goals to punch their ticket to the 2019 Calder Cup Playoffs, clinching the fourth and final spot in the North Division. The first-round matchup between the Marlies and Americans gets underway on Friday, April 19th in Rochester. Hudson Elynuik scored at 9:11 of the second period. This was his first AHL-career goal. Eemeli Rasanen recorded the primary assist on Elynuik’s second period goal. This was Rasanen’s first AHL point. Griffen Molino registered the secondary assist on Elynuik’s second period goal. Molino has four points (1 goal, 3 assists) in 36 games. Eamon McAdam stopped 36 of 41 shots he faced. McAdam is now 9-5-4-1 on the season with a .897 Save Percentage and a 2.99 Goals Against Average. Toronto is 24-11-6-2 since January 4 and have outscored their opponents 132-121, facing 17 different teams. In 32 of 43 games, Toronto has earned at least a point (56). Toronto was 3-for-3 for on the penalty kill and was 0-for-5 on the power play. Belleville had a 41-18 edge in shots in all situations. Erik Brown and Joseph Duszak led the Marlies with three shots on goal. The Marlies are 27-15-9-3 against North Division opponents and end the season 3-2-1-2 against the Monsters. The Marlies are 14-8-4-1 when tied after the first period and 3-18-2-1 when trailing after the second period. Toronto is 18-14-5-2 when outshot by their opponent. The Marlies are 4-4-3-1 in Sunday games and are 2-1-3-0 in April. Vincent LoVerde (knee) did not dress for today’s game. He left Toronto’s game in the second period against Rochester on March 24 and did not return. I thought that within the game there were some strong efforts at different times. I thought Joey Duszak had some really shining moments especially in that second period where he got skating and made some plays and did some real good things offensively. Those are the kind of things you’re looking to get out of today, I mean we weren’t too concerned about the score or anything that was going on in the game, we just wanted to give the guys a chance to play. We knew we were going to be unorganized. We knew for the guys that are regulars for us, they’re playing out of position and with different guys and mentally it’s a tough game to get through but in terms of those little efforts, little things that get revealed in the game you’re happy with that. We’ll take that for what it is and get ready for playoffs. Clearly, you’re going to be focusing on your opponent, first of all. We’ve played them a number of times through this season but you get to focus in on a little bit closer on them and then we’ll get on the ice and focus on some of those tactics but also just making sure our team is feeling good and we’re rested and we’re sharp and all those types of things that you need to be. We recognize we’ve got a great challenge ahead of us here against a very good team, so we’re going to have to make sure our game is as sharp and as good as it can be and really, we need to play our best hockey. So that’s really what the week is going to be about. I don’t think there’s anything in particular. We’re going to have to be really good in all areas of the game if we’re going to compete against a team as deep and talented as this Rochester team is, one of the top teams in the league, and they get their lineup bolstered pretty good by Buffalo not making the playoffs. We know we are going to be in for a challenge here so there’s no one particular area. We’re going to have to be really strong in every area of the game. So, it’s going to be a great challenge for our guys, it’s going to be exciting to work this week to put together a plan and get out on the road and find a way. The Toronto Marlies close out the 2018-19 regular season today with a North Division tilt against the Cleveland Monsters. This marks the eighth meeting between these division rivals, and the Monsters hold a 4-3 lead in the season series. The games between these two teams so far this season have been close, hard fought battles, with only one game having more than a one-goal differential. Five of their seven contests have required an overtime or shootout decision. Today’s game as major implications for Cleveland as the Monsters will be looking to punch their ticket to the 2019 Calder Cup playoffs. They’re coming off back-to-back losses to the league-leading Charlotte Checkers, and currently sit tied with the Belleville Senators for fourth place in the North Division. They’ll be desperate for a win against Toronto with the hope of clinching the final North Division playoff spot. Puck drops at 4:00PM on Leafs Nation Network and AHLTV. Fans across Canada can also stream the game live in the Toronto Maple Leafs app and follow us on Twitter and Instagram for behind-the-scenes action from Coca-Cola Coliseum.